RadioMentale is an electronic music, sound artists & DJ duo founded by Jean-Yves Leloup & Eric Pajot. They started their career in 1992, with their own radio show, playing experimental music, concrete music, ambient & electronic. During ten years, they produced this weekly and cult radio show in Paris for Radio FG (first french and independant electronic music station), national Swiss station Couleur 3 and Tokyo Shibuya FM. During this period, they also played in the first techno and rave parties organized in Paris, mainly in chill-out spaces. From the mid-90’s, they started to work in the field of contemporary art, composing sountracks and soundpieces for exhibitions, and collaborating with video artists, writers, designers or film directors. Since then, their work, their installations and performances, have been presented in various venues such as Palais de Tokyo in Paris, Centre Georges Pompidou, Kassel’s Documenta, Luxembourg Mudam, Paris Cité de la musique, Cartier Foundation, and various clubs, music and cinema festivals over the world. 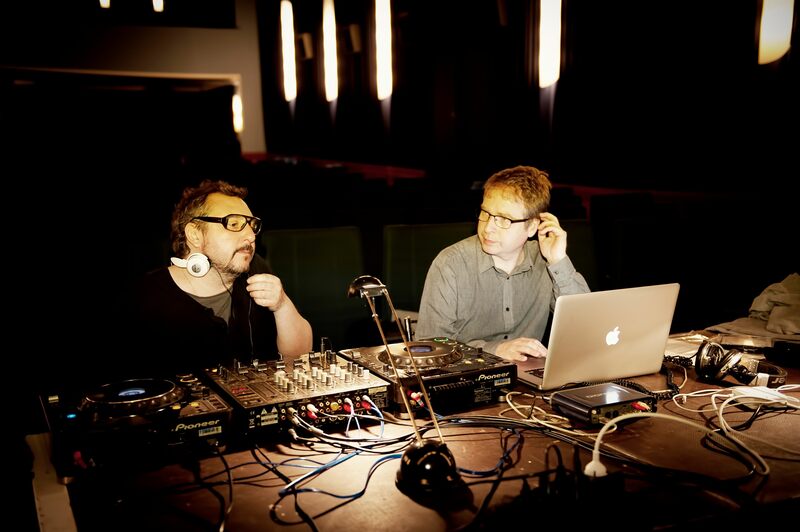 Since 2000, they are known as the pioneers of « cinemix », an audiovisual performing practise quite popular in France. As Djs and sound artists, they create new soundtracks for silent and classic experimental films (by Griffith, Murnau, Keaton, Vertov, and dada/surrealist artists), but also for modern talking movies, such Antonioni’s Blow Up, Gus Van Sant’s Gerry, Brian De Palma’s Dressed To Kill or David Cronenberg’s Videodrome. A RadioMentale performance or sound piece, is usually a collage drawing on an eclectic range of audio sources, including sound experiments, movie soundtracks, ambient music, experimental & electronic music, natural sounds, fragment of interviews and human voice. 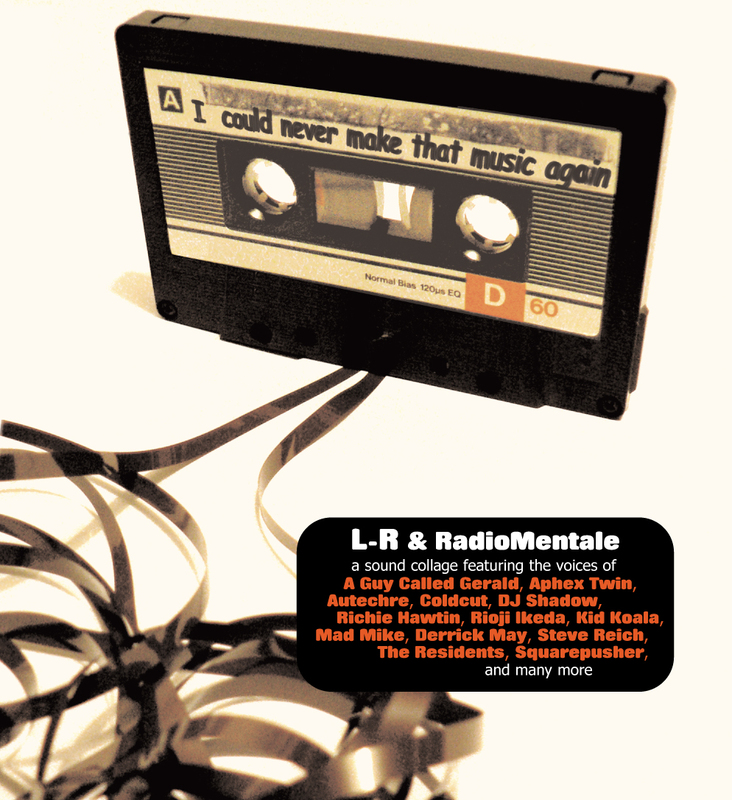 After two Mixed CDs, released in 1997 (the ambient/IDM The Slow Room) and 2004 (the more cinematic Cut-Up Scenario), they released in 2007 as L-R & RadioMentale (with Jean-Philippe Renoult), an album/voice collage/radio art piece entitled I Could Never Make That Music Again, for the belgian label Sub Rosa, awarded by a 2008 Qwartz Prize in France for best electronic artist. In 2012, their new album is entitled I-Land, gathering three recent original compositions, each one lasting twenty minutes. Mixing vocals with field recordings (natural and urban sounds) and electronic sounds, as well as revealing a rich and poetic universe, halfway between ambient, electro-acoustic and sound art. 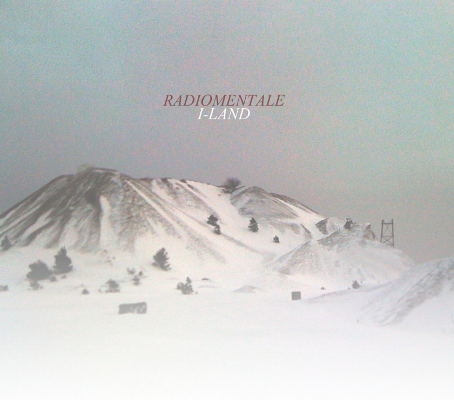 The characteristic features of Radiomentale’s sounds remain untouched: human vocals, immersion and hypnosis aesthetics, cinematic climate, sense of narration and atmospheres. Their latest sound and audiovisual pieces and installations were commissioned by the Paris Gaîté Lyrique and the Geneva Chamber Orchestra, the french ministry of culture, Montpellier ZAT festival, national radio stations France Culture (ACR : creative radio workshop) and France Musique (Tapage Nocturne radio show). Jean-Yves Leloup is a sound-artist, DJ, critic, journalist and a curator, specialized in electronic music, contemporary art & new technologies. He is the author of « Les Basiques : la musique électronique » (Olats.org), an online a free book dedicated to the history of electronic music, an essay entitled « Digital Magma » (2009, Sternberg Press) and also « Global Techno » (published in 1999 by Camion Blanc and republished by Scali in 2008). He has been the curator of the design and sound art project Audiolab. Born in 1968 in Paris. Lives and work in Paris. Eric Pajot is a visual artist, a musician and a DJ. He is the author of several DVDs on graphic and digital art; he produces scenic videos all the while carrying out two other musical projects with the duos Haarpband and White Bamby. Born in 1966 in Bourgogne. Lives and work in Paris. Live cinemix by Radiomentale in Metz. -Release of the album « I-Land » on F4T Music. -Swiss premiere of the audiovisual piece « D-Trains » on Swiss National Radio Espace 2. -Creation of a scenic video for « Different Trains » by Steve Reich, played by the Geneva Chamber Orchestra. -Monthly DJ Mix/Radio art show broadcasted on Radio Grenouille in Marseille. -Recording live of the sound piece « Sinking », created for the european sound art event, Ars Acustica, broadcasted in France on national radio, France Musique. -Creation of the audiovisual piece « D-Trains », inspired by Steve Reich « Different Trains », presented on stage at Paris Gaîté Lyrique with the Geneva Chamber Orchestra. -« Web-Jockey » audiovisual five screens performance, Paris Quai Branly Museum. -« Web-Jockey » audiovisual three screens performance, Digital Arti Gallery, Paris. -« Ghost Track » installation, ZAT festival, Montpellier. -« Looking Glass », audiovisual performance, ZAT festival, Montpellier. -« Vox », sound installation, Celleneuve church, ZAT festival, Montpellier. -Creation of the audiovisual piece « Looking Glass », inspired by Philip Glass « Mishima Quartet », presented on stage at Paris Gaîté Lyrique with the Geneva Chamber Orchestra. -Cinemix performance, based on Gus Van Sant’s « Gerry », Annonay, France. Lille, Calais, Choisy-le-Roi, Figeac, France. -Creation of the sound piece « Smooth Operator » for the Bruno Letort show, Tapage Nocturne, on national radio France Musique. -Creation of the sound piece « Recordare », commissioned by the french ministry of culture for the CNAP Collector exhibition in Lille. -Sound design for the film « Carré Blanc », by Jean-Baptiste Léonetti, (production Solair Films). -« Menace Néanderthale », three screens audiovisual performance, Le Lieu Unique, Nantes. -« Web-Jockey » audiovisual two screens performance, Door Studios, Paris. Lyon, France ; Edinburgh, Dundee, Scotland. -Creation of the sound piece/soundwalk « I Am Walking », Paris Fiac contemporary Art Fair. -Sound piece « Radiomarché, CD compilation Esmaa. -Sound piece « Mallarmix », for the Franck Ancel artist project Du livre de Mallarmé au livre mal armé. -Sound Piece « Listening To People Watching » for the online exhibition « On-Looking », www.or-bits.com. -Audiovisual installation « Ghost Track », presented for the Nuit Blanche (white night) event, Paris. -Sound piece/album/exhibition soundtrack « Traumavision », composed with the artist Pierre La Police, released on Stembogen. -Sound Piece « Una Dolce Notte » presented for the exhibition « Feedback : vibrations aller-retour, Part. 2 », Nevers, France. -Live performance with experimental movie director Hang Jung Lee, , Nabi Art Center, Seoul, South Korea. -Dadaist & surrealist movie program, live soundtrack by Radiomentale, Lille LAM Museum. Paris, Alès, Villeneuve St George, France. Aix-en-Provence, France ; Seoul, South Korea. Senlis, Antony, Nice, Bois d’Arcy, Terrasson, France. -Cinemix performance, based on Lotte Reininger’s « The Adventures of Prince Ahmed », Ankara, Turkey. Jecheon International Music & Film Festival, South Korea. -Cinemix performance, based on Dziga Vertov’s « The Man With A Movie Camera », Lyon, France. -Creation of the audiovisual piece « Ghost Track », Mota artist’s residency, Ljubjana, Slovenia. -Creation of the sound piece -« Les arbres se multiplient (Multiplying Trees )», for the national radio, France Musique. -« Me, Myself & iPod », radio documentary by Jean-Yves Leloup, national radio station France Culture. -Cinemix performance, based on Dziga Vertov’s « The Man With A Movie Camera », St Aignan, France. -Award winner of the 2008 Qwartz Prize, « best artist », for the « I Could Never Make That Music Again » album released on Sub Rosa. -Second season of our monthly radio show for the Marseille sation Radio Grenouille. -Sound piece « Una Dolce Notte ». Public broadcasting, Vieille Charité museum in Marseille, and inside the collective exhibition « In and Out Of Synch : A comment on cinema intermingled with the experience of three audible spaces », Triangle Space, Chelsea College of Art and Design. -Sound design and musical composition for the Henri de Gerlache & Christophe D’Yvoire documentary, « Célèbres Anonymes », broadcasted on Canal +. -Sound piece, « Airs Pop », public broadcasting, commissioned by the sound art festival Engrenages, Marseille. -Sound piece « ACR RMX », commissioned by the creative radio workshop of national radio station France Culture. Live presentation at the Rex Club. -Audiovisual performance/multiscreen video installation, « Gerry Tryptique », inspired by the Gus Van Sant movie, « Gerry », presented at the L’autre Canal venue in Metz. -Live soundtrack for the « Dada & Surrealist film » program, in Cherbourg & St Denis de la Réunion. -Live mixed soundtrack for the film « « Koyaanisqatsi » by Godfrey Reggio, La Bellevilloise, Paris ; Agence JAK, Paris ; Institut Français, Mainz, Germany ; Festival « La Nuit des arts sacrés », Eglise St Eustache, Paris ; Rencontres Musiques Electroacoustiques, Chartres. -Live mixed soundtrack for the film « Queen Kelly » by Erich Von Stroheim. Commissioned by the La Rochelle Film Festival. -Live mixed soundtrack for the film « Dressed To Kill » by Brian De Palma, « Ecoutez, c’est du cinéma ! » Festival, Paris. -Live mixed soundtrack for the film « Sunrise » by W. Murnau, Itinérances Film Festival, Alès. -Live mixed soundtrack for the experimental film « Decasia-The State of Decay », by Bill Morrison, la Blanchisserie contemporary art gallery, Paris. -Sound piece « Soundscape 1 : Sunday the 24th of June 2007 », commissioned by the sound art festival Engrenages, Paris and Marseille. -Release of the album « I Could Never Make That Music Again », on belgian label Sub Rosa. -Sound piece, « ¼ inches », commissioned by Arte Radio. -Sound piece « « Painting, Drawing, Cutting & Pasting », MP3 release, net-label SSS. -First season of our monthly residence for Marseille Radio Grenouille. -Live mixed soundtrack for the film « « Koyaanisqatsi » by Godfrey Reggio, french institute, Bucarest, Goethe Institut, Cluj, Romania. -Live soundtrack for the « Dada & Surrealist film » program, Eclectica Festival, Estonia and Le Volcan, Le Havre, France. -Remix for Rainier Lericolais, Optical Sound label. -Audiovisual untitled performance, Designer’s day, Moscow. -« Thousands of records (Walking Tree mix) », sound piece for the travelling exhibtion « Audiolab », Designer’s day, Moscow. -Public broadcasting of the sound piece « I Could Never Make That Music Again », Sonor Festival, Le Lieu Unique, Nantes. -Audiovisual performance/multiscreen video installation, « Gerry Tryptique », inspired by the Gus Van Sant movie, « Gerry », commissioned by La Cartonnerie, Reims. -Live soundtrack for the « Dada & Surrealist film » program, commissioned by the festival des Musique à l’écran, Toulon ; Territoires Electroniques festival, Aix-en-Provence. -Live mixed soundtrack for the film « Orphans in The Storm» by Griffith, Vendôme Film Festival. -Live mixed soundtrack for the film « Blow Up» by Antonioni, Tulle Festival. -Monthly performances at the Divan du Monde venue in Paris. Live mixed soundtracks for the films « Donnie Darko » by Richard Kelly, « Dressed To Kill» by Brian De Palma, « Blow Up » by Michelangelo Antonioni, « Cure » & « kaïro » by Kiyoshi Kurosawa. -Live mixed soundtrack for the film « Donnie Darko» by Richard Kelly, Musiques Volantes Festival, Metz. -« Sound Opera » performance, Centre Georges Pompidou. -« I Could Never Make That Music Again », sound piece commissioned by De Appel contemporary art center, Amsterdam, « Radio Days » exhibition. -Audivisual performances by Digital Cinema (Jean-Yves Leloup & Jérôme Duval) at Le Cube and Mains d’œuvres in Paris, and La Rochelle Film Festival. -Live Performance inspired by the sound piece « Una Dolce Notte », Cartier Foundation. -Soundtrack for the Pierre La Police exhibition « Traumavision », Agnes B. Gallery, Honk-Kong. -Live mixed soundtrack for the film Gerry», by Gus Van Sant, la Blanchisserie contemporary art gallery, Paris. -Eric ajot solo video pieces and limited edition T-Shirts, Gallery la Blanchisserie, FIAC (Contemporary Art Fair), Paris. -Cinemix performance on « Donnie Darko », Rencontres Cinématographiques de St Denis, Saint-Denis. -Performance and soundtrack for the Pierre La Police exhibition, Agnes B. Gallery, Tokyo-Ginza. -Performance and soundtrack for the Pierre La Police exhibition, Agnes B. Gallery,Paris. -Performance featuring Patrick Bouvet (writer), MUDAM (Museum of Modern Art), Luxembourg. -« Soyleent Green Picnic », video & Djing performance, a night of music, video and chill-out, Gallery La Blanchisserie, Boulogne. -JY Leloup solo mixed soundtrack for the « Aya » contemporary dance ballet, Yamaguchi Ycam and Osaka Itami Hall theater, Japan. -Video & Djing performance, « Les Lumières du Son », Nuit Blanche, Paris, open air festival. -Music & Djing performance at the Tarantino Party, Glazart, Paris. -Music & Djing performance, Electronautes festival, Batofar, Paris. -JY Leloup series of solo performances. Opening of The Orb DJ set. -Series of JY Leloup performances within the Digital Cinema project, in Paris (Palais de Tokyo, Nemo Festival), Lyon (Nuits Sonores festival), Marseille (Documentary festival), Tokyo (French Institut), Montreal (FCMM Cinema Festival). -2 cinemixes performances for the Dijon cinema festival, on « Altered States » by Ken Russel, and « Cure »by Kyoshi Kurosawa. -Video, music & DJing performance, Nuit Electro, Cité de la Musique, Paris, October. – Video, music & DJing performance, « Mulholand Highway », Glaz’art, Paris, October 2003. -Various « cinemix » performances for the « Electronic Cinema » tour, Nantes, Marseille, on « Cure » by Kyoshi Kurosawa. -« Cinemix » performance on the movie « Element of Crime » by Lars Von Trier, Paris (march), Nuits Sonores Festival in Lyon. -Presentation of the sound piece, « Una Dolce Notte», commissioned by the french ministry of culture, at the Femis school of cinema, Paris. -Performance for the « Space Tourism » night, Nouveau Casino, Paris, décember. -« Cinemix » performances on the movie « Vidéodrome » by David Cronenberg, autumn 2002, Paris & Marseille. – « Puzzle People » performance with the french writer Patrick Bouvet, November, Paris. -Release of the « Cut-Up Scenario » CD, Spring 2002, MK2 music. -Sound/video performance, Audiolives, Paris Palais de Tokyo, April 2002. -Video & sound piece for the web art project « Helium. Produced by the Nordic Institute for Contemporary Arts and curated by Cristina Ricupeiro). – « 2 Players » performance for the opening of the « Audiolab » exhibition, november 2001, Luxembourg Museum of Modern Art. – « Thousands of Records (Hyperactive Child Mix) » performance, Centre Pompidou, september 2001. -« Thousands of Records (Hyperactive Child Mix) », sound piece broadcasted for the « Hétérophonies » soundart issue of the on-line magazine, synesthésie, september 2001. -« Thousands of records », sound piece for the travelling exhibition « Audiolab », Contemporary art museum of Strasbourg, Centre Georges Pompidou, Luxembourg Museum of Modern Art. -Performance at the Aquaplanning festival, Hyères, France. -« The Soundscaped & remixed Fight Club », sound & movie performance, Le Batofar, Paris. -Performance for the « Revues Parlées », Centre Georges Pompidou. -DJ Mix at the « Futuria 2000 » rave, Paris Zénith venue, September 2000. -Participation at the Global Tekno 2000 Event, La Beauté exhibition, Avignon, France, summer 2000. » Radio Selva « , soundtrack for the multimedia Saas Fee installation » The Electronic Dreamplant « . -Participation to the « On Air » collective performance, with artists Valery Grancher, Evelyne Koeppel, Dominique Gonzales-Foerster and Takuji Kogo, antic theater of Arles, summer 2000. -Point/ligne/plan gallery, showing of the » Ipanema Théories » long feature by Dominique Gonzales-Foerster (soundtrack by Radio Mentale), Cannes, France 2000. -Performance and live creation of the soundtrack for the Dominique Gonzales-Foerster long feature, « Ipanema Théories », FEMIS (Paris International cinema school), 2000. -« Surfmusic 3 (A simple text transmission) « , specific soundpiece for netsurfing, exclusively conceived for the http://www.united-art-space.com contemporary art website. -Performance and mix for the ZAC exhibition, ARC/Paris museum of Modern Art, 1999. -Performance for the re-opening of the FEMIS cinema school, Paris, 1999. -Monthly mixes and multimedia performances at the Dolores Parties, What’s Up Bar, Paris, 1998-99. -« Surf Music 1 & 2 », sound environments for the Documenta X, Kassel, 1997. -« Tech Low », sound environment for the Global Tekno 2 exhibition, Passage de Retz, Paris, 1997. -Performance and sound environment (« Tech Low »), Global Tekno 3 exhibition, Galerie Pour la Vie of the CAPC museum of Bordeaux, 1996. -« Regresse », sound environment for the « Auto-Reverse » exhibition, Le Magasin, Grenoble, 1996. -« Mute », sound environment, « Dimensional Theory » exhibition, Nikolaj art center, Copenhagen,1996. -« Mute », sound environment for the « X,Y » exhibition, Centre Georges Pompidou, 1995. -Performance for the « The Show Must Go On » event, Fondation Cartier, Paris, 1995.